In 1996 I was cast as Arthur Lang, the new downstairs neighbor on Webster, the long running television series. Arthur was a circus clown who quit the circus to attend veterinary school and rented the downstairs apartment in the Papadapolis household. Arthur ran away from the circus to join a family! 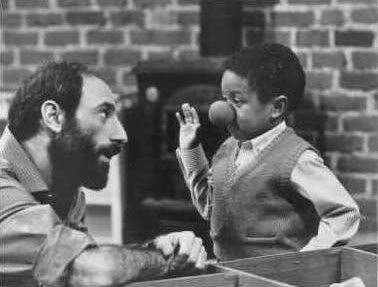 A warm avuncular relationship developed between Arthur and Webster, the little boy of the house, played by Emanuel Lewis. Soon, long brewing tensions in the production erupted, and the show was not renewed. Arthur Lang was never heard from again. Said Katherine in her mid-west twang. As he poked around the house. Came Webster with a frown. For Arthur Lang had passed away. The writers wrote him out. “Surely, we can rent the room. Who’d taught him how to juggle. And Webster brought the shovel. But Arthur Lang was not there. He’d vanished, without a trace. They seldom leave a trace. With no men left on base.